What are the Different Kinds of Hammers? What Type of Conduit for Outside? Framing a wall is one of the most basic parts of home construction. 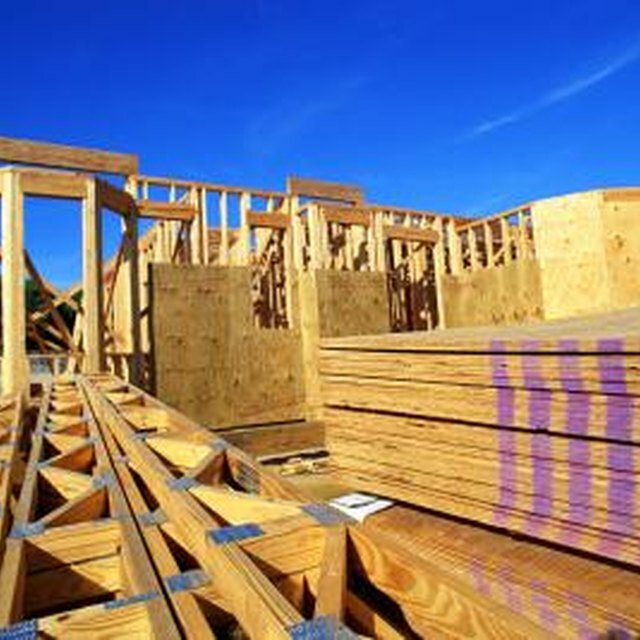 The quality of the construction of the whole house relies on the framing being done correctly. As with any task, to do a job correctly requires having the right tools. Framing doesn't require a lot of expensive tools, but you should buy good-quality tools that you can rely on. A framing hammer usually has a straight claw. The shank is usually wood or fiberglass. For framing you'll need a 20- to 24-oz. hammer. The hammer is used for driving the nails to hold the studs to the sill plate and to nail the sill plate to the floor joist. A tape measure is necessary for figuring out how long to cut the 2-by-4s for framing. The tape should be at least 25 feet long and 1 inch wide. A large framing square is necessary for making straight lines and right angles. Buy a good-quality aluminum or stainless framing square if you want it to last. A speed square is a triangle-shaped metal square. It allows you to quickly and easily mark the studs where they should be cut and where they should be attached to the sill plate. A plumb bob is a weight on a piece of string that is used to tell if something is straight vertically. Most chalk lines can be used as a plumb bob. A carpenter's level uses a bubble in a solution to tell if something is level, either horizontally or vertically. A level will be easier to use. A circular saw is an electric, hand-held saw which has a round blade. It works well for cutting straight lines, but should not be used for curves. It is useful for cutting studs, sheathing and joists. As with any saw, use it with care because it can cause serious injury. A carpenter's pencil is flat, with flat lead. This keeps it from rolling away. It can be sharpened with a knife or the large opening of a pencil sharpener. The lead is harder than in a traditional pencil so it doesn't break as easily. Chalk lines are used for laying out straight lines. Two chalk lines, one red and one blue, make it easy to keep track of chalk lines that are laid out for different purposes. A ladder allows you to reach areas that are too high to reach from the ground. You will need a ladder to attach studs to headers in bearing walls. A freelancer from South Dakota, Maria Tussing has been writing since 2000. She has been published in "Family Fish & Game," "Wondertime," "Today's Horse" and "Cattle Business Weekly," among other publications. Tussing holds a Bachelor of Science in journalism from Chadron State College. What Is a Drywall Hammer Used For? What Kind of Saw Will Make Vertical Cuts? What Is Foam Board Insulation?